Upcycling, the act of repurposing old, abandoned materials or spaces and giving it a new purpose, is a trend that has taken the world by storm. Abandoned buildings and even shipping containers can be upcycled into stunning pieces of architecture with an element of comforting nostalgia. Upcycling ensures that resources are used to their fullest extent, minimizing the number of trips made to the landfill. Vivian Kim, a travel writer, takes us deeper into this topic and introduces two examples of upcycling architecture from her time in both Korea and the Netherlands. Steel is 100% recyclable, which makes it one of the most ideal materials for upcycling. Other construction materials, such as wood and plastic, can only be recycled a limited number of times before they lose its original properties and functionality and need to be downcycled (recycled into a material that is of lower quality than the original material). Steel, on the other hand, never loses its original quality. In fact, it can even increase in value and be upgraded to a higher grade of steel with the same amount of energy it would take to recycle it. Steel is also reusable. Entire buildings made of steel can be reused or have their lives extended by years, just by making small improvements. Because steel can be easily reused for its original purpose, there is less of a need to use raw materials from scratch, allowing for more sustainable construction. Let’s take a look at some of the most widely recognized pieces of upcycling architecture in the Netherlands and Korea. Utilizing recycled materials in the design of a building is nothing new. In fact, upcycling in the Netherlands had its beginnings in the 1960’s when a small, social movement began in Jordaan, a well-known neighborhood in Amsterdam. The Dutch began to mobilize the community to protect their historical buildings and prevent constant demolition from taking place. Local governments also recognized the importance of reusing and remanufacturing materials from an economic standpoint and began to push for more upcycling initiatives. A great example of this is the NDSM ship wharf, the site of the former Dutch Shipbuilding and Dry Dock Company. Just a 15-minute ferry ride from Amsterdam Central Station, the NDSM was once one of the largest shipbuilding companies in the world. However, a shortage of shipbuilding orders led to the company’s eventual closure in 1984. The abandoned shipyard soon became the breeding grounds for “city nomads” and local artists to take their place and breathe new life into the empty buildings. Through their efforts, the NDSM quarter was transformed into what is now a cultural hotspot in Amsterdam. 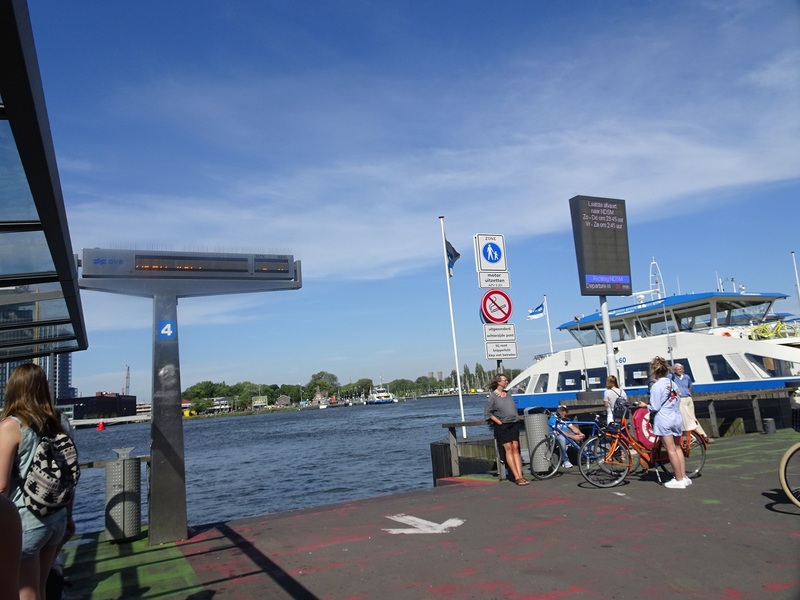 The NDSM ferry stop in Amsterdam Central. As soon as visitors step off the ferry, they are greeted by what looks like a scene from an eerie, sci-fi movie. The NDSM ship wharf is full of gray, bleak buildings covered with graffiti and steel containers that are painted bright red and blue. The former NDSM wharf is now Amsterdam’s newest creative hot spot. 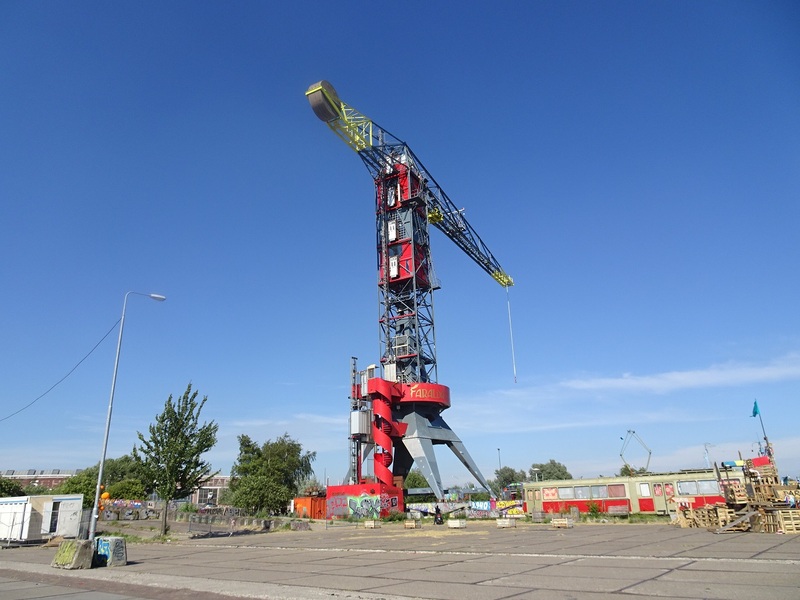 At the center of the NDSM wharf stands a monumental, 50-meter-high crane called Crane 13. It is painted in red, blue and yellow, the signature colors of Dutch artist Mondrian. Built in 1951 by Hensen Ltd., it was one of the largest cranes in the world but slowly faded from the public’s memory with the closure of the shipbuilding company. The Crane Hotel Faralda, transformed from a rusty, old crane into a luxurious high-end hotel. In the spirit of upcycling, the 60-year-old rusty crane was transformed into the Crane Hotel Faralda in 2013 despite immense technical challenges. The hotel, named after a female Dutch spy who saved hundreds of people during World War II, is made entirely of steel. As a crane’s main purpose is to lift heavy objects, only the strongest of steel is used to build it. 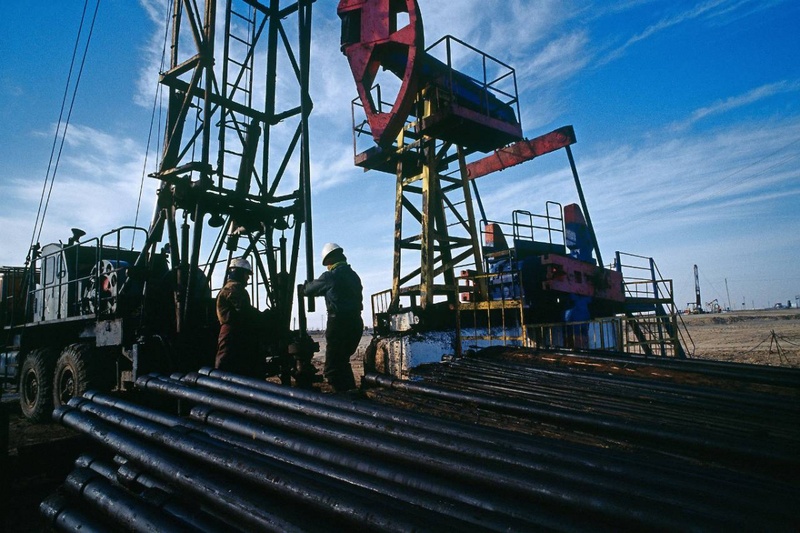 For this reason, High-Strength Low-Alloy Steel (HSLA) is often employed. It contains 0.05% of carbon and other raw materials such as chromium, nickel, molybdenum, and vanadium – the secret behind its enhanced strength. HSLA steel is also more resistant to atmospheric corrosion, enabling Crane 13 to withstand the strong Netherland winds of the North Sea for over 60 years. In the following time-lapse video, watch how the rusty crane transforms into an iconic symbol of the NDSM quarter and one of Europe’s most unique and sensational hotels. Another example of upcycling that shifts the culture can be found in the quaint neighborhood of Seongsu-Dong, South Korea. Known as the “Brooklyn of Seoul”, Seongsu-Dong is known for its trendy and hip cafes embedded in between old warehouses and factories. Its roots can be traced back to the 1970s where steel, leather and printing factories once dominated the streets. But, beginning in 2010, a wave of cafés, galleries, and studios began to break into the bleak space, transforming the once gray industrial district to a colorful vibrant scene brimming with new sights and sounds. 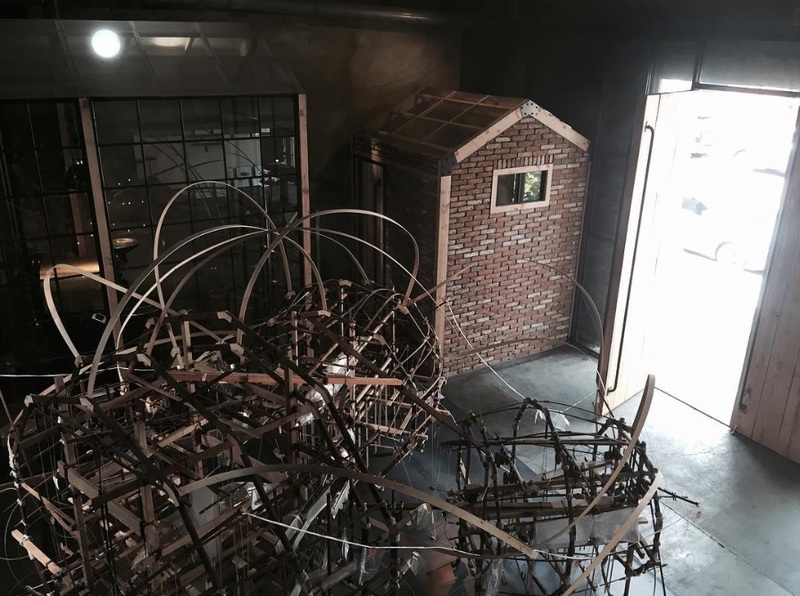 Hidden within the streets of Seongsu-Dong is the Daelim Warehouse, an old rice mill that has in recent years, been upcycled into a multi-cultural hub that doubles as a café and performance/exhibition venue for the artist community. From the bare concrete walls to the metal rod ceiling structure, it retains the distinct flair of a warehouse, cultivating a special atmosphere that has people flocking to it on a regular basis. Because of its unique interior, it has even been acknowledged as one of the most Instagram-worthy spots in Seoul. From the NDSM quarter in Amsterdam to the Seongsu-Dong neighborhood in Seoul, upcycling has become a worldwide trend improving our surroundings as we live, create and build. Just as steel has been with mankind for thousands of years, it will continue to play a crucial role in recycling, reusing and upcycling. Vivian Kim is an online travel writer and correspondent based in the Netherlands for Naver Travel+, a Korean travel portal.